On October 16, 1979: a landslide at the Nice Airport, an aseismic submarine landslide, and two tsunamis that struck the coast near Nice. Submarine landslides are marine landslides that transport sediment across the continental shelf and into the deep ocean. A submarine landslide is initiated when the downwards driving stress exceeds the resisting stress of the seafloor slope material causing movements along one or more concave to planar rupture surfaces. Submarine landslides take place in a variety of different settings including planes as low as 1° and can cause significant damage to both life and property. Recent advances have been made in understanding the nature and processes of submarine landslides through the use of sidescan sonar and other seafloor mapping technology. A tsunami or tidal wave,, also known as a seismic sea wave, is a series of waves in a water body caused by the displacement of a large volume of water, generally in an ocean or a large lake. Earthquakes, volcanic eruptions and other underwater explosions (including detonations, landslides, glacier calvings, meteorite impacts and other disturbances above or below water all have the potential to generate a tsunami. Unlike normal ocean waves, which are generated by wind, or tides, which are generated by the gravitational pull of the Moon and the Sun, a tsunami is generated by the displacement of water. Nice is the seventh most populous urban area in France and the capital of the Alpes-Maritimes département. The metropolitan area of Nice extends beyond the administrative city limits, with a population of about 1 million on an area of 721 km2 (278 sq mi). Located in the French Riviera, on the south east coast of France on the Mediterranean Sea, at the foot of the Alps, Nice is the second-largest French city on the Mediterranean coast and the second-largest city in the Provence-Alpes-Côte d'Azur region after Marseille. Nice is approximately 13 kilometres (8.1 mi) from the principality of Monaco and 30 kilometres (19 mi) from the French-Italian border. Nice's airport serves as a gateway to the region. The two waves struck the coast between the Italian border and the town of Antibes (60 miles; 96 km). They reached 3 m high near Nice and 3.5 m  at La Salis (Antibes) and decreased in amplitude from there. Antibes is a Mediterranean resort in the Alpes-Maritimes department of southeastern France, on the Côte d'Azur between Cannes and Nice. It has been estimated that between 8  and 23  people died in these events. 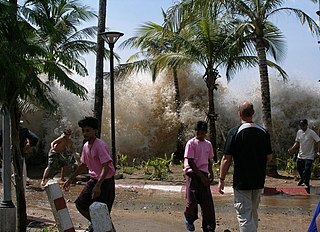 The tsunamis inundated a 20-mile section of the coast. The water travelled up to 150 m inland. The 11 people swept away in Nice and one in Antibes were presumed dead. Economic damages were large. The airport works were finished, but this event has precluded the construction of a new port for Nice. 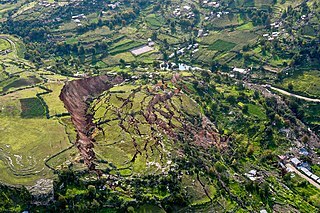 The term landslide or, less frequently, landslip, refers to several forms of mass wasting that include a wide range of ground movements, such as rockfalls, deep-seated slope failures, mudflows and debris flows. Landslides occur in a variety of environments, characterized by either steep or gentle slope gradients: from mountain ranges to coastal cliffs or even underwater, in which case they are called submarine landslides. Gravity is the primary driving force for a landslide to occur, but there are other factors affecting slope stability which produce specific conditions that make a slope prone to failure. 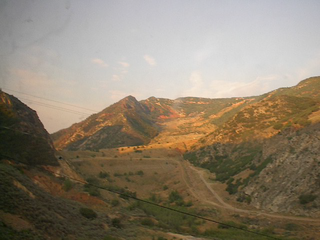 In many cases, the landslide is triggered by a specific event, although this is not always identifiable. A megatsunami is a very large wave created by a large, sudden displacement of material into a body of water. A slump is a form of mass wasting that occurs when a coherent mass of loosely consolidated materials or rock layers moves a short distance down a slope. Movement is characterized by sliding along a concave-upward or planar surface. Causes of slumping include earthquake shocks, thorough wetting, freezing and thawing, undercutting, and loading of a slope. Alexander Tollmann's bolide, proposed by Edith Kristan-Tollmann and Alexander Tollmann in 1994, is a hypothesis presented by Austrian geologist Alexander Tollmann and paleontologist Edith Kristan-Tollmann, suggesting that one or several bolides struck the Earth at 7640 BCE (±200), with a much smaller one at 3150 BCE (±200). If true, this hypothesis explains early Holocene extinctions and possibly legends of the Universal Deluge. The Kaikoura Peninsula is located in the northeast of New Zealand's South Island. It protrudes five kilometres into the Pacific Ocean. The town of Kaikoura is located on the north shore of the peninsula. The peninsula has been settled by Maori for approximately 1000 years, and by Europeans since the 1800s, when whaling operations began off the Kaikoura Coast. Since the end of whaling in 1922 whales have been allowed to thrive and the region is now a popular whale watching destination. The three Storegga Slides are considered to be amongst the largest known landslides. They occurred under water, at the edge of Norway's continental shelf in the Norwegian Sea, approximately 6225–6170 BCE. The collapse involved an estimated 290 km (180 mi) length of coastal shelf, with a total volume of 3,500 km3 (840 cu mi) of debris, which caused a very large tsunami in the North Atlantic Ocean. The 1929 Grand Banks earthquake occurred on November 18. The shock had a moment magnitude of 7.2 and a maximum Rossi–Forel intensity of VI and was centered in the Atlantic Ocean off the south coast of Newfoundland in the Laurentian Slope Seismic Zone. The Manila Trench is an oceanic trench in the Pacific Ocean, located west of the islands of Luzon and Mindoro in the Philippines. The trench reaches a depth of about 5,400 metres (17,700 ft), in contrast with the average depth of the South China Sea of about 1,500 metres (4,900 ft). It is created by subduction, in which the Sunda Plate is subducting under the Philippine Mobile Belt, producing this almost N-S trending trench. The convergent boundary is terminated to the north by the Taiwan collision zone, and to the south by the Mindoro terrane. It is an area pervaded by negative gravity anomalies. A submarine canyon is a steep-sided valley cut into the seabed of the continental slope, sometimes extending well onto the continental shelf, having nearly vertical walls, and occasionally having canyon wall heights of up to 5 km, from canyon floor to canyon rim, as with the Great Bahama Canyon. Just as above-sea-level canyons serve as channels for the flow of water across land, submarine canyons serve as channels for the flow of turbidity currents across the seafloor. Turbidity currents are flows of dense, sediment laden waters that are supplied by rivers, or generated on the seabed by storms, submarine landslides, earthquakes, and other soil disturbances. Turbidity currents travel down slope at great speed, eroding the continental slope and finally depositing sediment onto the abyssal plain, where the particles settle out. The Hilina Slump, on the south flank of the Kilauea Volcano on the southeast coast of the Big Island of Hawaii, is the most notable of several landslides that ring each of the Hawaiian Islands. These landslides are the means by which material deposited at a volcano's vents are transferred downward and seaward, eventually spilling onto the seabed to broaden the island. A chevron is a wedge-shaped sediment deposit observed on coastlines and continental interiors around the world. The term chevron was originally used independently by Maxwell and Haynes and Hearty and others for large, V-shaped, sub-linear to parabolic landforms in southwestern Egypt and on islands in the eastern, windward Bahamas. A geohazard is a geological state that may lead to widespread damage or risk. Geohazards are geological and environmental conditions and involve long-term or short-term geological processes. Geohazards can be relatively small features, but they can also attain huge dimensions and affect local and regional socio-economy to a large extent. Tsunamis affecting the British Isles are extremely uncommon, and there have only been two confirmed cases in recorded history. Meteotsunamis are somewhat more common, especially on the southern coasts of England around the English and Bristol Channels. The 1692 Jamaica earthquake struck Port Royal, Jamaica on 7 June. A stopped pocket watch found in the harbour in 1969 indicated that it occurred around 11:43 a.m. The 1707 Hōei earthquake struck south-central Japan at 14:00 local time on 28 October 1707. It was the largest earthquake in Japanese history until the 2011 Tōhoku earthquake surpassed it. It caused moderate to severe damage throughout southwestern Honshu, Shikoku and southeastern Kyūshū. The earthquake, and the resulting destructive tsunami, caused more than 5,000 casualties. This event ruptured all of the segments of the Nankai megathrust simultaneously, the only earthquake known to have done this, with an estimated magnitude of 8.6 ML. It might also have triggered the last eruption of Mount Fuji 49 days later. 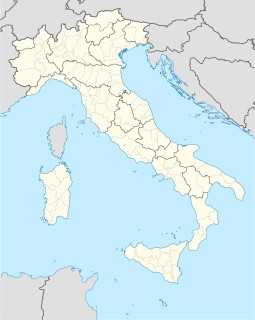 Marsili is a large undersea volcano in the Tyrrhenian Sea, about 175 kilometers (109 mi) south of Naples. The seamount is about 3,000 m tall; its peak and crater are about 450 m below the sea surface. Though it has not erupted in recorded history, volcanologists believe that Marsili is a relatively fragile-walled structure, made of low-density and unstable rocks, fed by the underlying shallow magma chamber. Volcanologists with the Italian National Institute of Geophysics and Volcanology (INGV) announced on March 29, 2010 that Marsili could erupt at any time, and might experience a catastrophic collapse that would suddenly release vast amounts of magma in an undersea eruption and landslide that could trigger destructive tsunamis on the Italian coast and nearby Mediterranean coastlines. The 1993 southwest-off Hokkaido earthquake occurred at 13:17:12 UTC on 12 July 1993 in the Sea of Japan near the island of Hokkaido. It had a magnitude of 7.7 on the moment magnitude scale and a maximum felt intensity of VIII (Severe) on the Mercalli intensity scale. It triggered a major tsunami that caused deaths on Hokkaidō and in southeastern Russia, with a total of 230 fatalities recorded. The island of Okushiri was hardest hit, with 165 casualties from the earthquake, the tsunami and a large landslide. 1 2 Allaby, M. (2004). A Chronology of Weather. Infobase Publishing. 1 2 3 4 Sahal, A., & Lemahieu, A. (2011). The 1979 nice airport tsunami: mapping of the flood in Antibes. Natural hazards, 56(3), 833–840. ↑ Lee, H. J., Locat, J., Desgagnés, P., Parsons, J. D., McAdoo, B. G., Orange, D. L., ... & Boulanger, E. (2007). Submarine mass movements on continental margins. Continental margin sedimentation: from sediment transport to sequence stratigraphy, 213–274. 1 2 3 Seed, H. B. (1988). The landslide at the Port of Nice on October 16, 1979. Earthquake Engineering Research Center, University of California. ↑ Nisbet, E. G., & Piper, D. J. (1998). Giant submarine landslides. Nature, 392(6674), 329–330. ↑ Rana, S. V. S. (2007). Essentials of ecology and environmental science. PHI Learning Pvt. Ltd..
↑ Dudley, W. C., & Lee, M. (1998). Tsunami!. University of Hawaii Press.